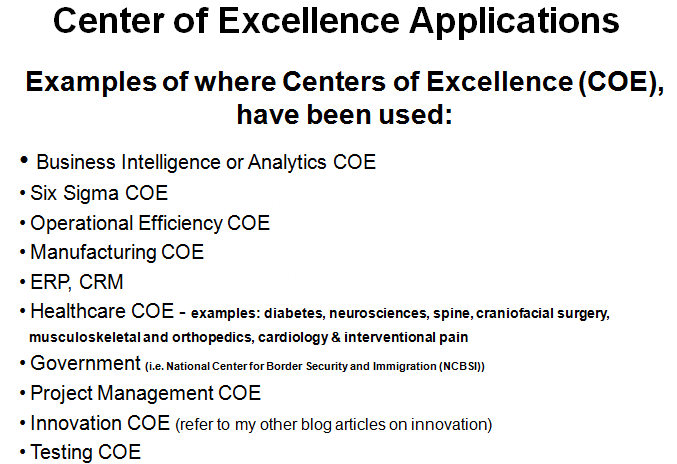 Above: Center of excellence defined. Another way to think of a center of excellence is as an internal set of expert consultants available to assist you with specific sets of initiatives. Above is another, more simple, definition of a center of excellence. 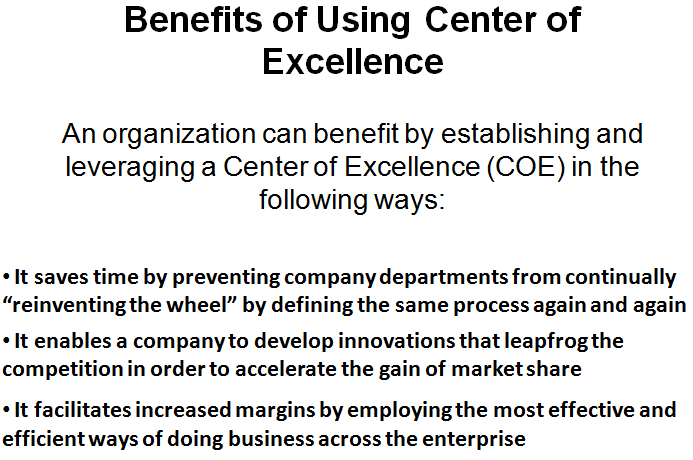 Above is a few (of many) benefits of implementing a center of excellence. The most important aspect of a center of excellence is that it facilitates your company to getting ahead of your competitors and increases the chance that the company will attain market leader status. Above is a list of sample companies that utilize centers of excellence. In order to explore the details associated with these companies and their center(s) of excellence, merely Google the company name along with “center of excellence” to find out more. 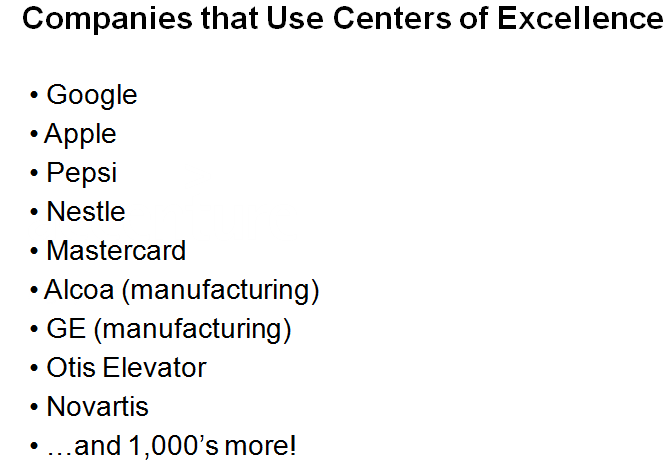 Above are the types of centers of excellence that have been implemented by Fortune 500 companies in the past. Recently, I helped a Fortune 500 company implement both a CRM center of excellence (COE) and a Testing COE. We will perform a deeper dive into a testing center of excellence later in this post to illustrate a few details associated with a COE’s setup, operation, functions, etc. 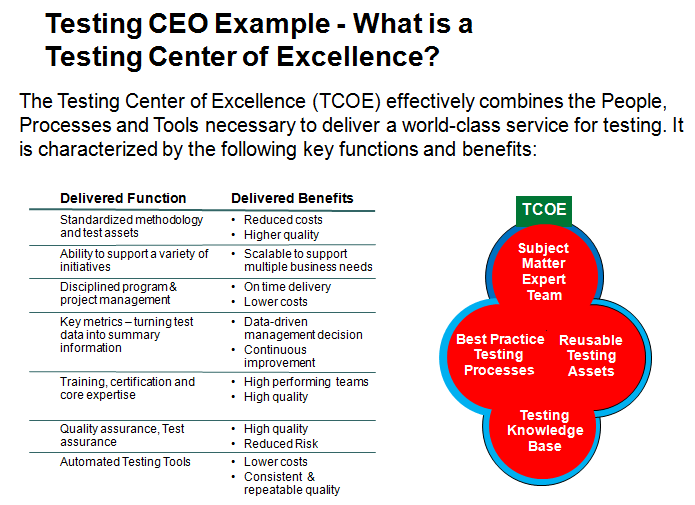 The illustration above depicts the types of functions specifically delivered by a testing center of excellence (TCOE) as well as the associated benefits. For example, a TCOE maintains a training and certification function in order to help train other company teams on delivering higher quality testing and associated consumer products/services. 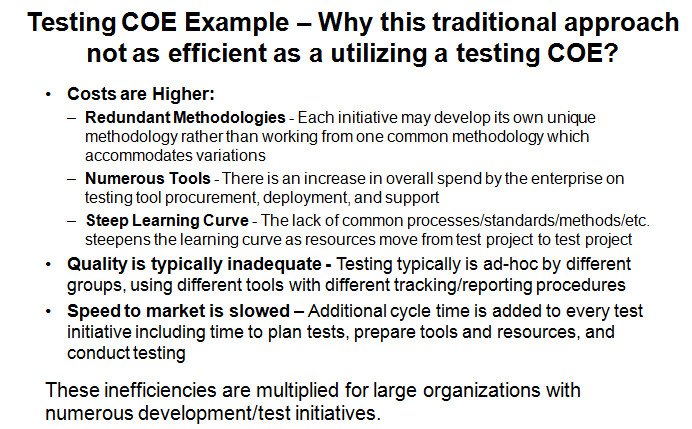 “Hold on a minute you” might say at this point and then ask, “Why would you need a testing center of excellence (TCOE)?” Anticipating your potential push-back, the above illustrates the inefficiencies associated with performing one-off testing in a decentralized basis without TCOE support and oversight. 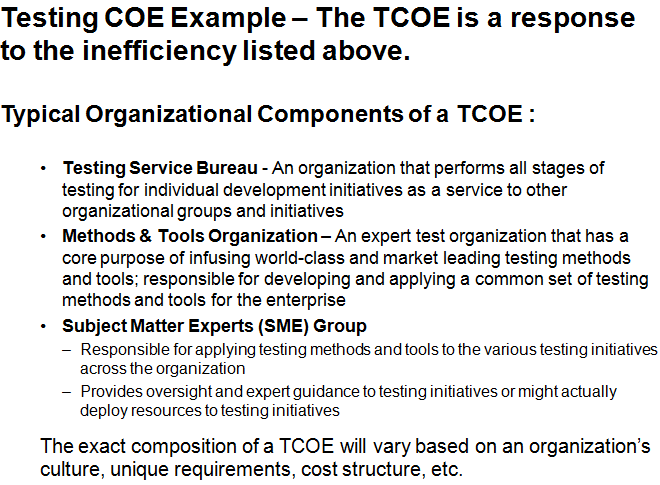 The illustration above lists some specific examples of additional inefficiencies associated with performing case-by-case ad-hoc testing in lieu of having implemented a TCOE. 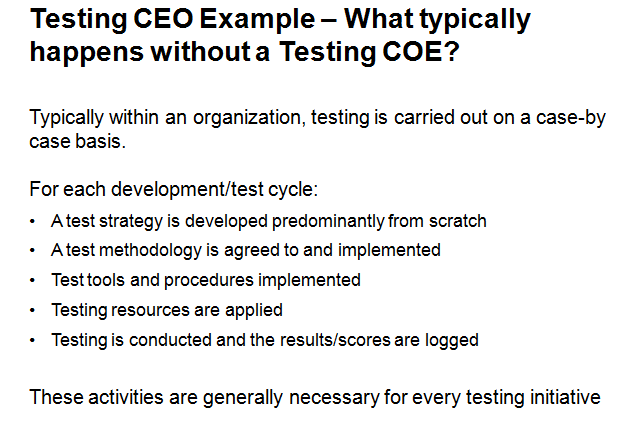 What are the functions and/or organizational components of a testing COE you might ask? Above is my viewpoint on the typical organizational components and functions delivered by a TCOE. There are many others, but the above are the most frequent functions delivered by TCOE organizational components. The first service typically delivered by a TCOE is to provide testing services to various company team and development initiatives. 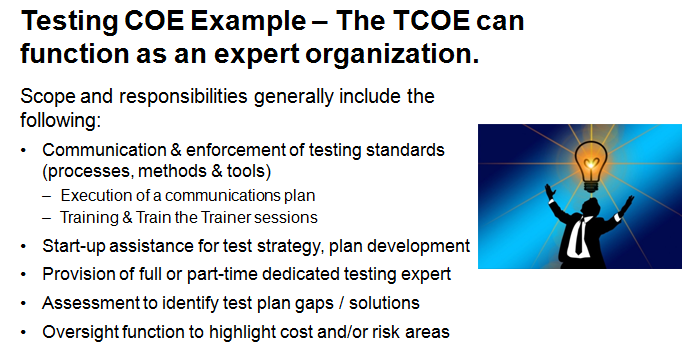 The above illustrates the types of testing services provided by a TCOE to other company teams/department. The second service typically delivered by a TCOE is to develop, maintain and deploy testing methods, tools and processes to other company departments and associated testing initiatives. The third service typically delivered by a TCOE is to provide consulting style expertise to other company departments and associated testing initiatives. 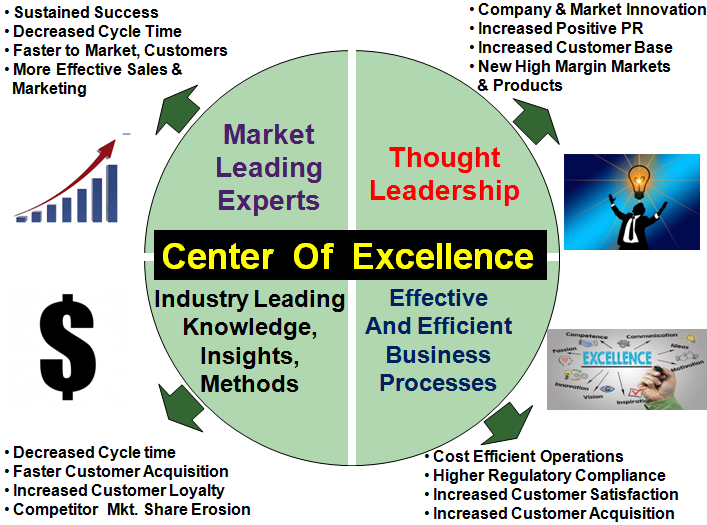 That concludes my overview of what a center of excellence is and what it can do for your company. If yes, please give me a call, I call help you implement world-class center of excellence that enable you to surpass your competition and bring your organization to the next level of market performance and share. Are you as a CxO so focused on the tasks at hand that you don’t take the time to re-group and assess what is working and not working? Likewise, are you too focused to take the time to determine what in your operations is effective and what corrective action is needed on a ongoing, consistent basis? Are you “operations bound” whereby your team members are out of bandwidth due to barely keeping up with ongoing marketing, sales, communications and PR production schedules? 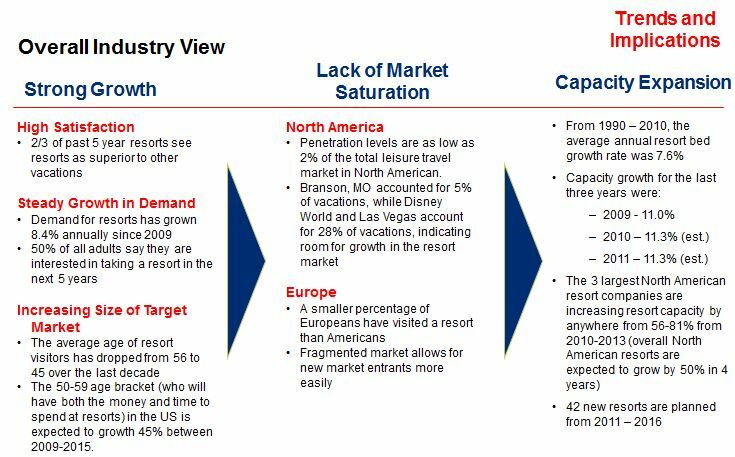 Do you find the company getting further and further behind competitors capabilities, effectiveness, market presence as well as sales volume? Are you behind on learning the latest capabilities and advances in digital asset management, marketing & content management artificial intelligence (AI), and how block-chain can help your effectiveness? 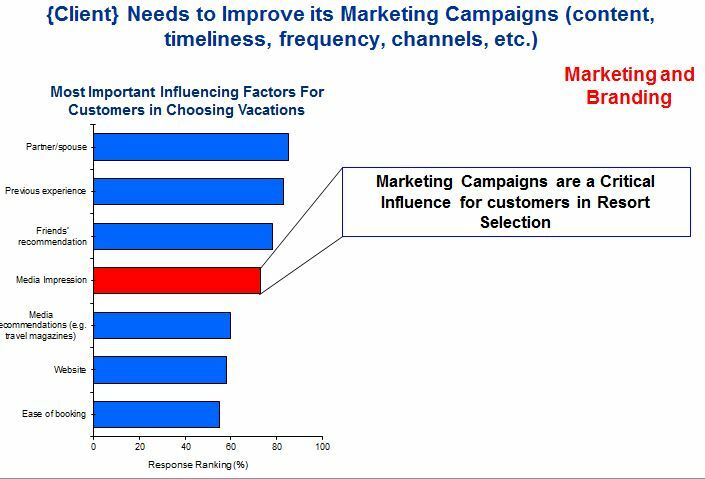 Per question #4 do you know how these advances can improve the effectiveness in your marketing, sales, PR, communications while simultaneously increasing profitable revenue while simultaneously reducing your operating costs? 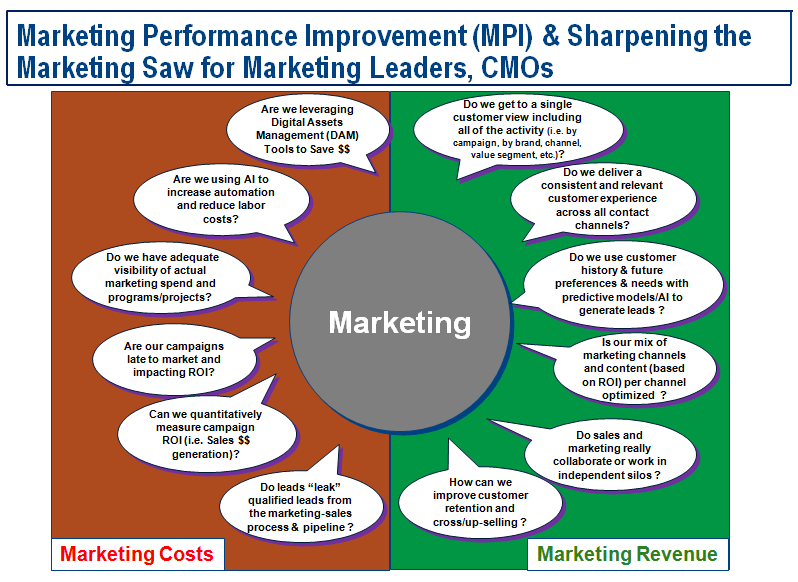 If you answered “yes” to any of the above questions, you are really in need of a Marketing Process Improvement (MPI) initiative and an infusion of a ‘Saw Sharpening” process. The benefit of implementing this continuous improvement process is that your company will increase the chance that it will evolve into the envy of the marketplace in terms of team leadership, capabilities and overall market effectiveness. 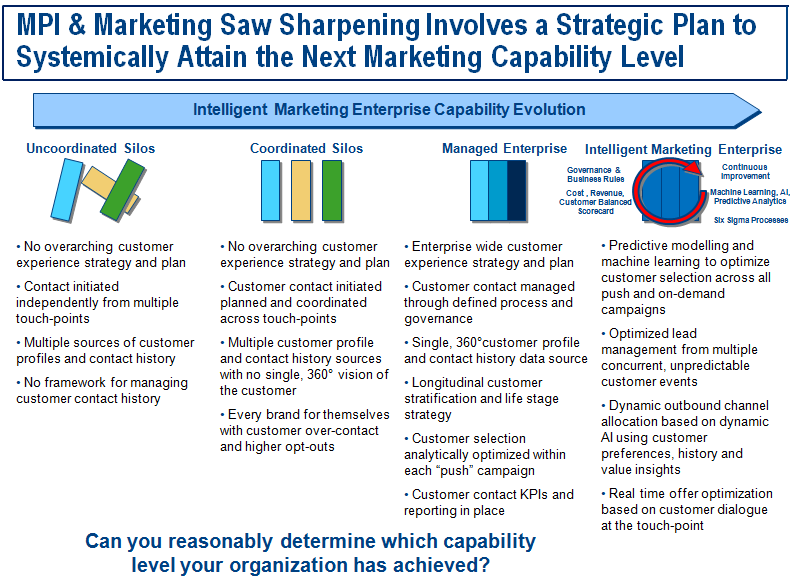 The remainder of this blog is a short primer and motivator in getting your company to consider becoming a ‘Saw Sharpening’ organization focused on improving profitability, market share and overall shareholder value improvement. 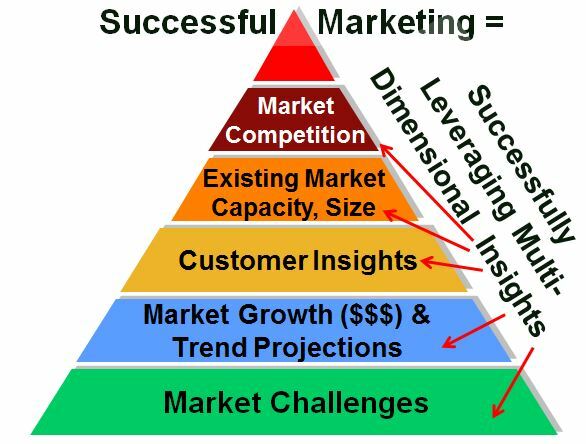 Have you mapped out how capable your company is in terms of marketing, customer management, sales, etc. 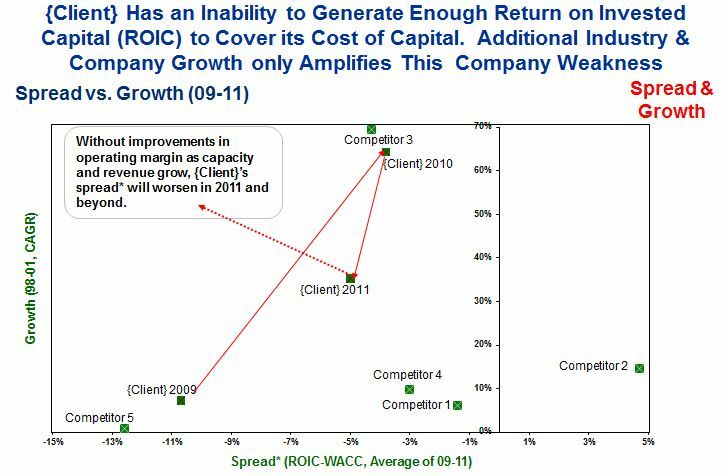 such that you can accurately place your company into a capability level as shown in the above chart? Have you created an evolutionary road-map in order to mature your organization into a more capable and effective organization over time (i.e. 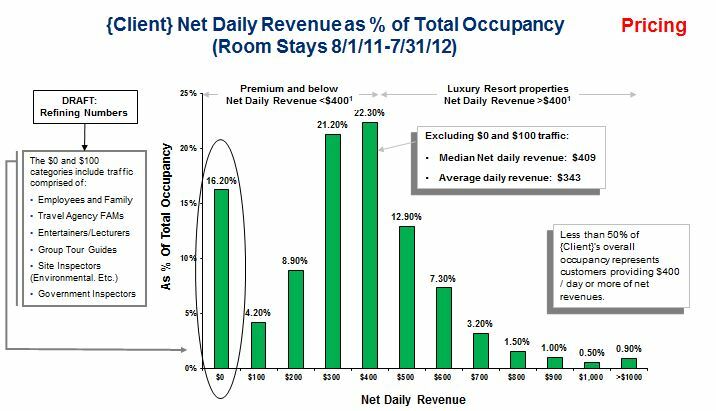 lower expenses and increase profitable revenue) in order to leapfrog your competition and gain market share? Can you accurately assess your competitor(s) capabilities such that you know where they are better than your company and in which specific areas? Are you aware that business rules engine technology can help you automate your marketing campaign management process such that marketers do not have to be as manually involved (i.e. campaign set up, execution and post campaign results analysis)? This technology will save your company time and $$ by allowing your marketers to focus on all important marketing strategy vs. being ‘campaign jockeys’ and marketing production focused most of their time. Are you aware that powerful and real-time analytic engines can help with channel mix optimization such that you are marketing to the most effective and cost efficient customer channel at all times? Are you aware that leading Digital Asset Management (DAM) tools now have artificial intelligence baked right in as to help you manage, find and retrieve your digital assets across marketing, PR, sales, communications, etc. – all saving you time and enabling your content to be more compelling to your customers? Associated with question #3, are you really aware of the benefits of Digital Asset Management (DAM) tools and how it can help you go to market more effectively and cost efficiently? Eliminates the cost of lost or misplaced digital assets. DAM virtually eliminates the costs associated with losing valuable digital assets due to the robust and highly organized digital asset repository (via a highly logical DAM taxonomy) which enables marketers to find and (re)use digital assets quickly. Reduces creative production development cycle times. DAM tools help users quickly create and re-purpose digital assets. Reduces the time to bring new campaigns to market. Marketers, sales, PR, communication, etc. are able to get campaign related digital out to various markets and customers at the ‘speed of need’. Eliminates duplication of work. The central asset repository that DAM provides greatly reduces the possibility of costly asset duplication. Improves collaboration and access to critical assets. DAM tools facilitate collaboration among marketers via a centralized control of digital assets. Ensures brand consistency and brand integrity.Ensures marketers, sales, PR, communication, etc. have access to the most up-to-date digital assets as opposed to users being allowed to select non brand compliant assets. Improves Marketing ROI: Enables marketers, sales, PR, communication, etc to use the most effective digital assets that will produce the greatest impact and ROI. Honestly assess whether your team feels as though your company is as capable as it needs to be – processes not too manual, error prone, ineffective, lagging as compared to competitors, wrong approach and strategy, inefficient tactics, etc. Set time aside each week for team saw sharpening activities and to discuss initiatives you need to implement to improve capabilities and overall effectiveness. Benchmark your performance in certain areas like e-mail open and click through rates, sales $$ per campaign, campaign cycle time and/or accuracy, Google ad-words performance, etc., net promoter score(s) and constantly challenge the team to improve incrementally as well as dramatically after the implementation of new capabilities. Hire an honest, impartial outside consultant to independently assess your capabilities and benchmark these capability areas against market leaders. 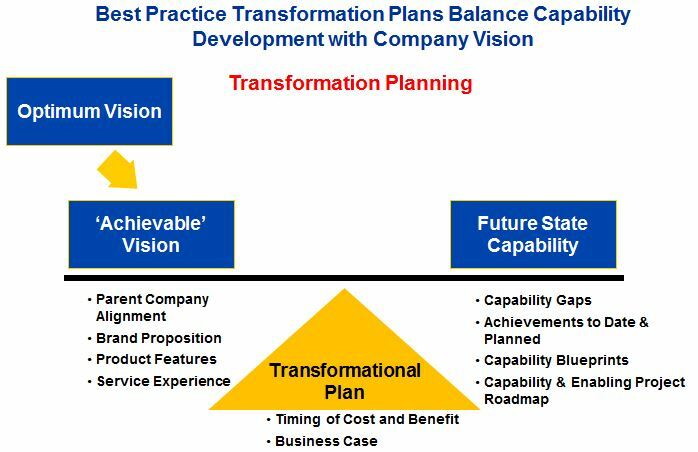 Leverage a consultant to help you develop an evolution roadmap over 2-5 years for your company to attain market leader status including business case with investment and capability implementation plan. Is your organization planning on launching a new brand or optimizing an existing one? If so, give me a call or e-mail me, I can help you implement a MPI or ‘Saw Sharpening’ process that would enable you to surpass your competition and bring your organization or agency to the next level of market effectiveness and excellence. Does your company encounter any of the following, yet you are unable to determine the root cause? 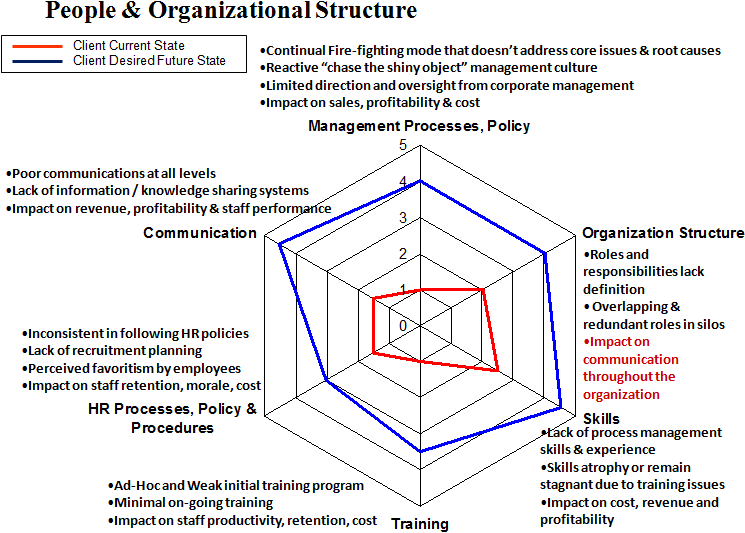 Determine Organization’s Current State Health & Capabilities – Through a series of Key stakeholder interviews and current state assessment work-shops, holistically baseline the company’s top line organizational capabilities – sales, marketing, financial practices, organization, management practices, processes, etc. Determine Organization’s Desired Future State – While interviewing key stakeholders determine gaps in the current set of holistic capabilities and determine a consensus for key future state capabilities that need to be developed, implemented and/or evolved. 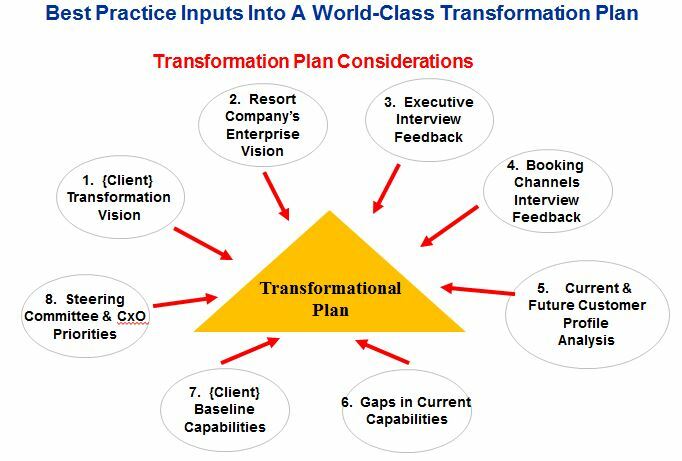 Per step #1 of the process, above is an example of a set of high level organizational change drivers that were cultivated through a series of executive interviews. In order to holistically assess an organization’s current state health and capability levels, I have developed a comprehensive and systemic diagnostic process along with structured questions and interview guides used to interview key stakeholders and to conduct assessment work-shops. 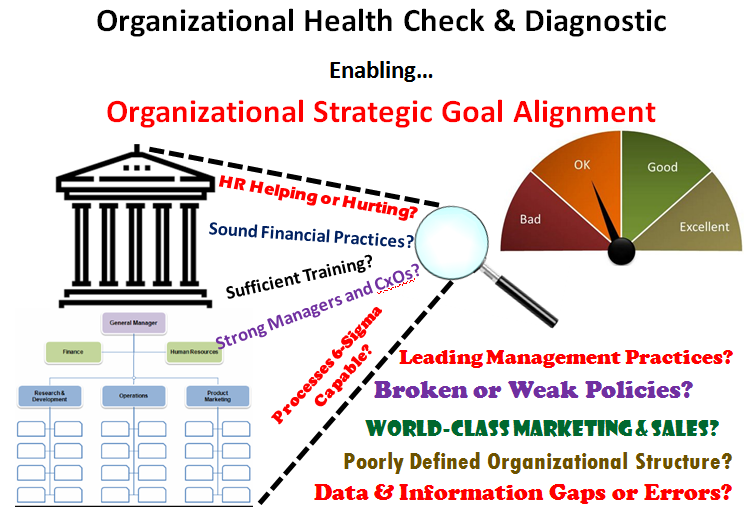 Above is a great tool I use to perform a final read-out summary of an organization’s current state health assessment. 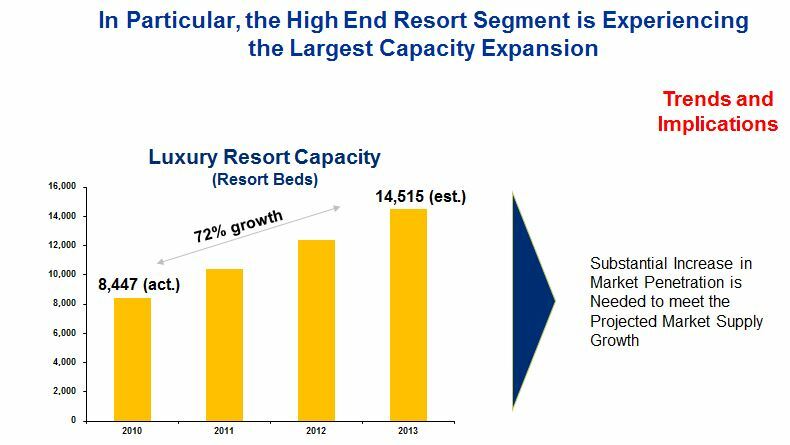 The chart is an Excel Spider Chart (Google it and how to create) and is used to benchmark an array of multi-dimensional capabilities. 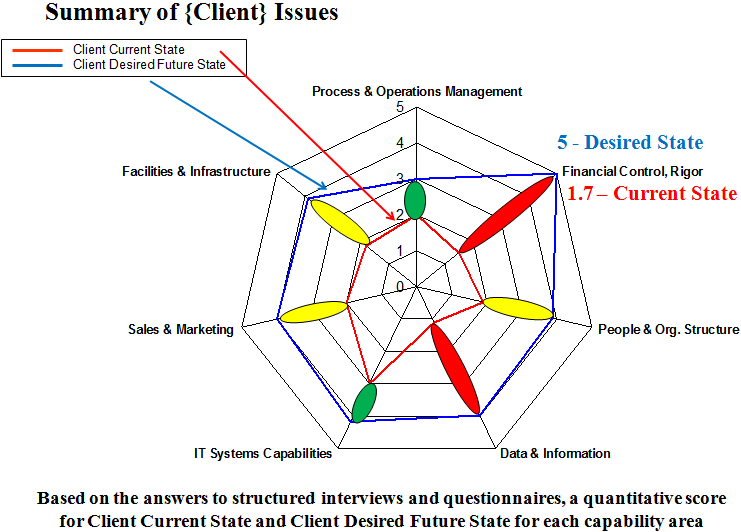 In this example, based on the summary of all interviews and workshops, the red line represents the summary score for seven (7) current state capability areas for a large pharmaceutical client. 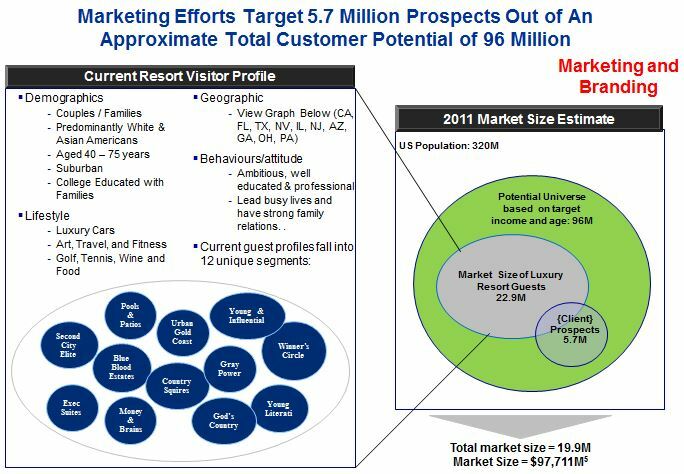 The blue line is the summary consensus score for what the organization feels should be the capability levels for the future state for these same seven (7) capability areas. A green oval represents a small gap between current and future state capability levels; a yellow represents a moderate gap; and, lastly, a red oval highlights a large or very large gap between current and future state capabilities (e.g. Financial Control, Rigor). 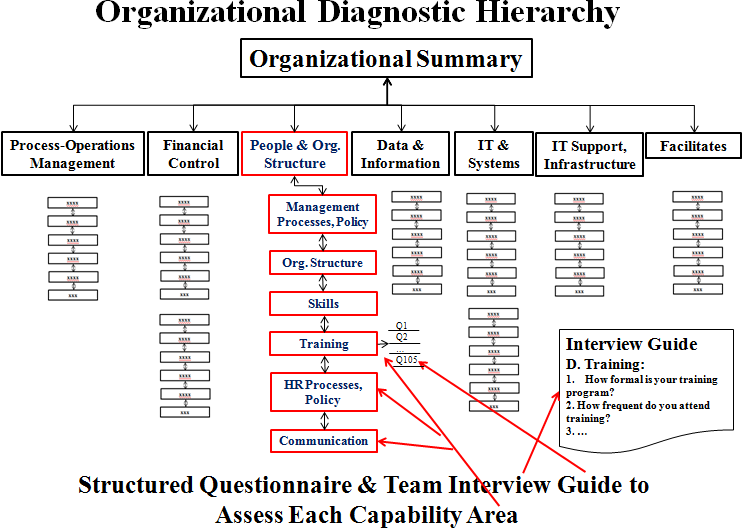 Above is a sample “deeper dive” into the analysis performed under the capability area “People & Organizational Structure” shown in the previous executive summary chart. In this example, we see that “Communication” and “Management Processes, Policy” have the largest capabilities gaps while “Skills” and “Organizational Structure” have the smallest capability deltas (difference between current state and desired future state). According to Kikipedia, the term innovation derives from the Latin word innovatus, which is the noun form of innovare “to renew or change,” stemming from in-“into” + novus-“new”. Although the term is broadly used, innovation generally refers to the creation of better or more effective products, processes, technologies, or ideas. At GE, an innovation program was developed during the late 1980’s called “Work-Out” as part of Jack Welch’s drive for better productivity, efficiency and greater innovation. Initially, GE’s Work-Out program was intended to identify and eliminate unneeded processes and tasks that were left over from previous years that became inefficient, as Jack put it, riding ourselves of meaningless tasks “Just because that’s the way we always did things”. 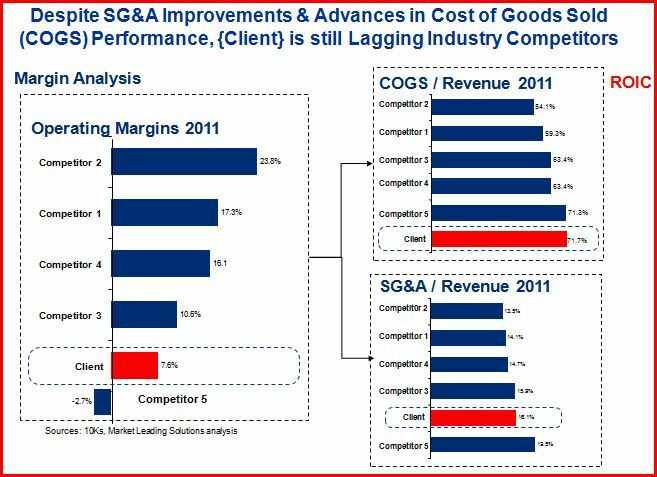 After the restructuring identified via Work-Out, many GE groups accomplished their goals with fewer people and with reduced cycle time which drove ever higher levels of increased revenues, reduced costs and greater customer satisfaction & delivery. The aptly named GE Work-Out process involved identifying an area in need of improvement and assembling a cross-functional team of people together from all aspects of the business (design, marketing, production, sales, manufacturing, software, etc.) to identify a better process, method, strategy, etc. The task for GE Work-Out teams was to meet outside of its normal work environment (and occasionally outside normal working hours) to discuss business inefficiencies and to develop business improvement recommendations. As Work-Out unfolded, Jack Welch began to recognize that employees were an important source of new and creative ideas that would drive overall corporate innovation. Jack then drove to create a sustainable innovation environment that pushed towards a relentless, endless and companywide search for a “finding a better way, every day.” The Work-Out program was then evolved into a methodology that was created to reduce bureaucracy and to empower every employee, from managers to janitorial staff, an opportunity to improve and innovate on GE’s operations. From a corporate perspective, the goal of the Work-Out program was to streamline GE and to make workers more productive and processes simpler and more straightforward. From an employee perspective, Work-Out was an empowering program that enabled everyone to contribute suggestions, innovative ideas and corporate efficiency perspectives to make their jobs easier/better and enabled them to deliver higher value to customers and to the company/stockholders. Employees, in short, considered the program ‘liberating’ and a way to shape their own work-place destiny. 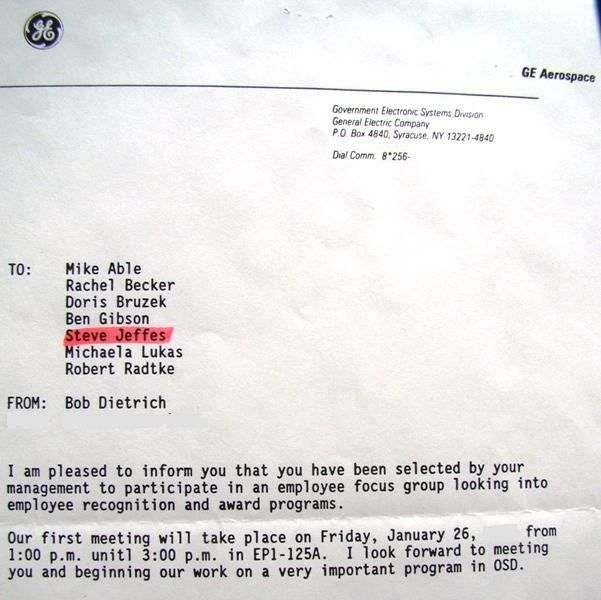 Due to my constant contributions that led to millions of dollars of savings at GE, I was actually asked to participate on Jack Welch’s Work-Out council at the GE Aerospace Division Level. From my perspective, GE’s Work-Out program was one of the most progressive innovation programs ever created (My perspective on having consulted with, and have insights on, nearly all of the Fortune 100 companies and over half of the Fortune 500 companies). The following is my perspective on the ingredients and recipe for a highly successful innovation program like GE’s Work-Out. From my perspective, creating a highly successful hyper-innovation program, similar to that of GE’s Work-Out program, depends on developing a balanced approach of delivering both value to company and sense of purpose & engagement to the employees. The following charts highlight the balanced scorecard that should be the cornerstone of measuring the health of an innovation program. I call this the eight (8) over eight (8) Innovation Scorecard and, if the eight (8) over eight (8) measures are in balance, then ‘the company will be Great & the Employees will be driven to Innovate’. (The left of chart (Y-Axis) indicates my take on the relative imporance of each of the eight factors). 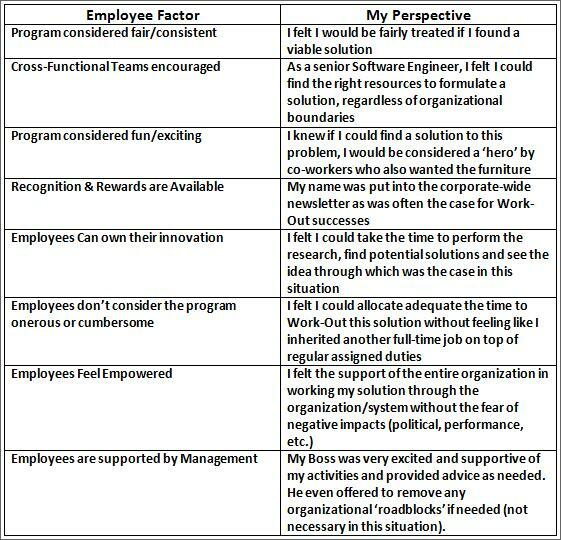 Employees Feel that the Program is Fair & Consistent – Employees believe that the best innovation ideas are supported vs. those coming from the most popular, powerful or political employees. At GE, we felt very good that the best ideas were more important to management vs. the ideas of the most favored employees/managers. 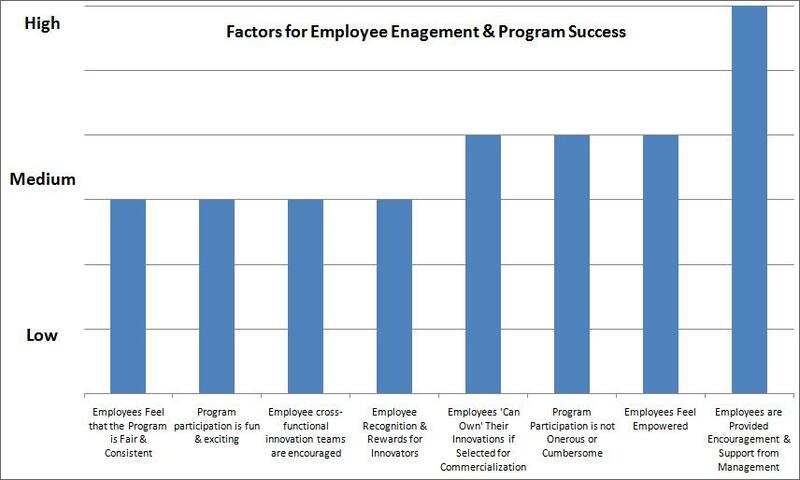 Program participation is fun & exciting – Employees actually feel more content with their jobs and participating in the program is “cool”, “exciting”, “exhilarating”, etc. I never had more fun in a job than when I was participating and contributing to the GE Work-Out program. I actually looked forward to coming to work to find additional savings, ‘better ways’, etc. Additionally, water cooler chat at GE was many times about the excitement and activities of the Work-Out program and ‘what teams were up to’ in developing their ideas. Employee cross-functional innovation teams are encouraged – Employees feel like they can cross organizational boundaries to get ideas developed and evolved without fear of negative inter-organizational political or ‘turf’ ramifications. At GE, when we named the cross-functional team members needed to formulate and evolve an idea, management helped ensure that this cross-functional team was on-board along with each of their managers. Employee Recognition & Rewards are Available for Innovators – Employees are provided incentives & rewards for ‘stepping up’ and developing innovations and, as such, are treated with special/extra compensation for being innovation trailblazers. 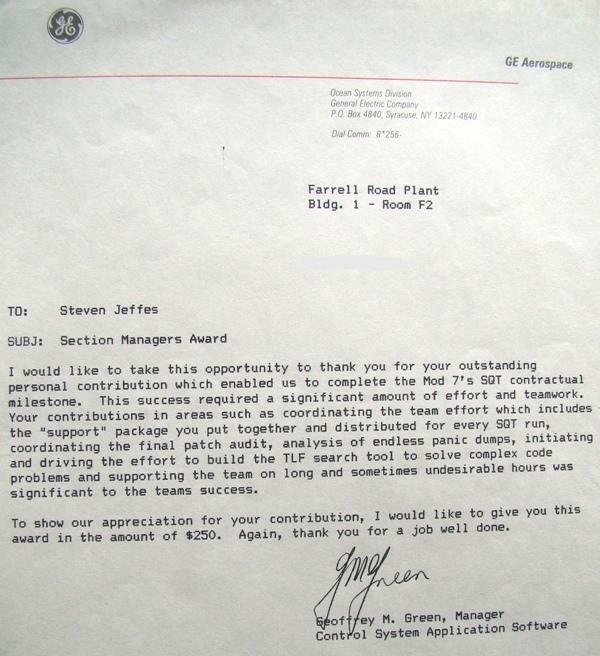 At GE, there was an array of special recognitions available to top innovators including dinner with senior management, extra cash awards, mention in the company newsletter, potential level increases, etc. As a top innovator at GE, you could get thousand in additional compensation for innovations and going above and beyond the call of duty associated with your normal job responsibilities. Employees ‘Can Own’ Their Innovations if Selected for Commercialization – Employees can see their ideas and innovations become reality and participate in all aspects of its commercialization process vs. ‘having the company move the idea forward without its originator. The worst thing a company can do to an employee who ‘birthed the idea’ is to say ‘thank you, we’ll take it from here’ and not allow the employee to participate in helping their innovation evolve and become reality. Program Participation is not Onerous or Cumbersome – Employees should not feel punished or overly burdened for ‘stepping up’ and are not made to feel like they will lose any work-life balance for being an innovator. At GE, extra time was set aside for Work-Out and ‘the innovation process’ vs. making it yet another job everyone had to take on in addition to their existing full-time job. Employees Feel Empowered – Employees should feel like there are no obstacles for them to develop innovations and that they have the latitude equal that of the CEO to make things happen to ensure innovation team success. In this fashion, employees feel like ‘they own’ the program and can direct top management to support their initiatives. At GE, employees were ‘charged up’ and were challenging each other constantly to see which group, team, and/or sets of employees could find more efficiencies, greater cost take-out, or better ways of doing things. Once the employees felt like they ‘could change the world’, no manager would dare to stand in their way in fear of being ridiculed for being archaic, a ‘road block’ or worse – an impediment of the program. The “Coolest” managers were considered those who helped support the teams and were also contributing to finding greater efficiencies themselves. In addition to the eight employee factors for a successful innovation program, there must also be well thought out components from a company-program perspective. 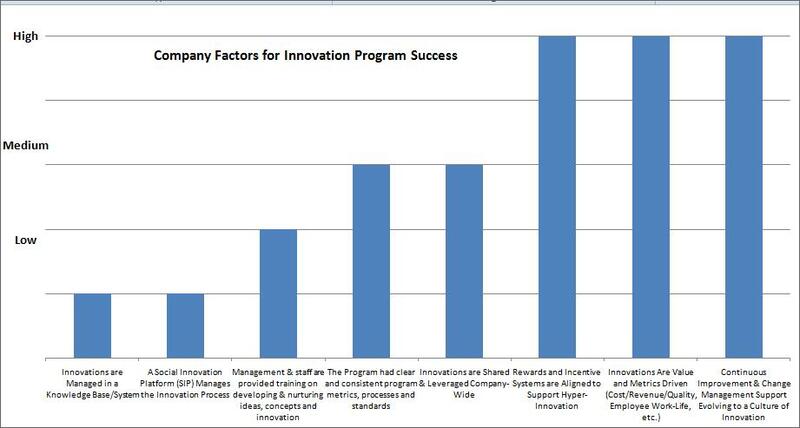 The following chart depicts the company factors and their relative importance that must also be in place to make an innovation program successful. Innovations are Managed in a Knowledge Base/System – In order to keep track of innovations, who originated the ideas, as well as the associated business cases for proving the commercial value of the innovation, a robust innovation knowledge base/system is needed. This helps to ensure that there are duplicate or overlapping innovations, allows the search for existing innovations that can be leveraged vs. re-inventing it for each division, region, etc. At GE, the process was manual and was very cumbersome. Many duplicate innovations were created, and it was very difficult to leverage the innovation corporate-wide due to limited (paper based) visibility into innovations ‘in-progress’ or ‘being developed’. A Social Innovation Platform (SIP) Manages the Innovation Process – As discussed in a previous blog entry of mine, many Social Innovation Platforms have been developed that fairly and consistently manage the innovation process. These systems did not exist at the time of the GE Work-Out program, but would have helped in managing the process and could have improved the perceived fairness of the programs administration. Interestingly enough, GE now utilizes Social Innovation Platforms to manage its innovation process. Management & staff are provided training on developing & nurturing ideas, concepts and innovation – Developing and managing the innovation process is not something that comes naturally for many companies. Therefore, in order for the program to be successful, the company and staff need to learn ‘how to’ manage the process most efficiently and effectively and how to tailor and evolve the program to specific and/or changing needs. At GE, this training was more ad-hoc and on the job, so there were many instances of re-work, false starts, and duplication of effort. We eventually became good at the innovation process, but a good training program would have helped us avoid many missteps. The Program has clear and consistent program metrics, processes and standards – In order for the program to be perceived fair and consistent by the employees, the program must be managed strategically and program governance (i.e. metrics/measured/processes/etc.) must be continually assessed and adapted for further improvement. 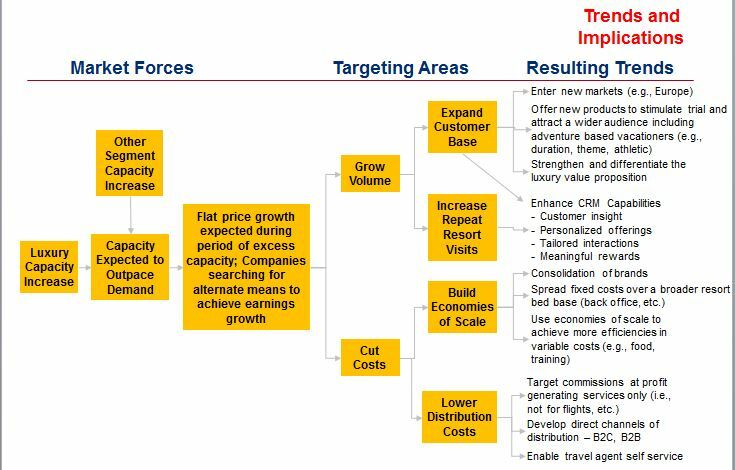 At GE, this step was lacking and was only done on an ad-hoc basis and by each division vs. corporate-wide. Innovations are Shared & Leveraged Company-Wide – In order to leverage the value of innovations that could be leveraged company-wide a corporate committee should review emerging innovations to determine the degree that this could be leveraged in order to determine the sum total of its applied business value (applied in one division only, one region, company-wide, etc.). At GE, every division was on their own and there was seldom sharing of innovations between division (i.e. GE Aerospace and GE Aircraft Engines). Rewards and Incentive Systems are Aligned to Support Hyper-Innovation – In order for an innovation program to be successful, the company alone cannot be the sole beneficiary. The company must share the wealth with the employees by sharing in a portion (1-20%) of the value of suggestion (cost take-out, revenue enhancement, quality improvement leading to additional contract captures, etc.). 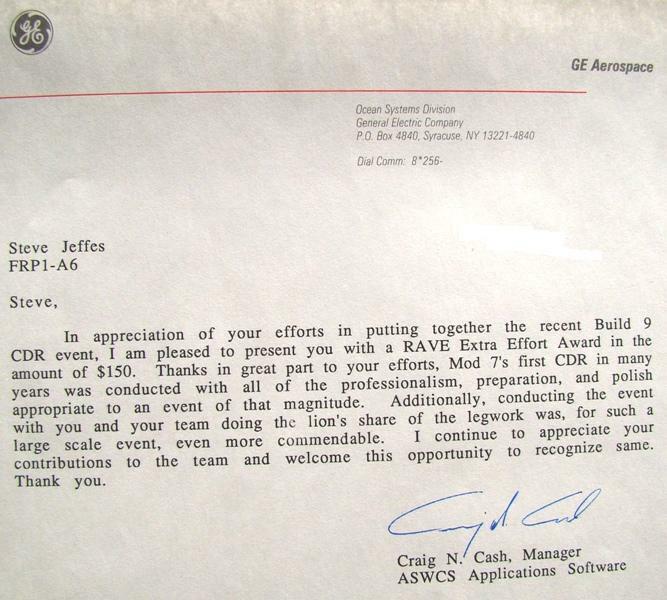 At GE, we developed a program called RAVE – Recognition Awards for Valued Employees that distributed large sums of incentive $$ for suggesting business innovations/improvements, etc. 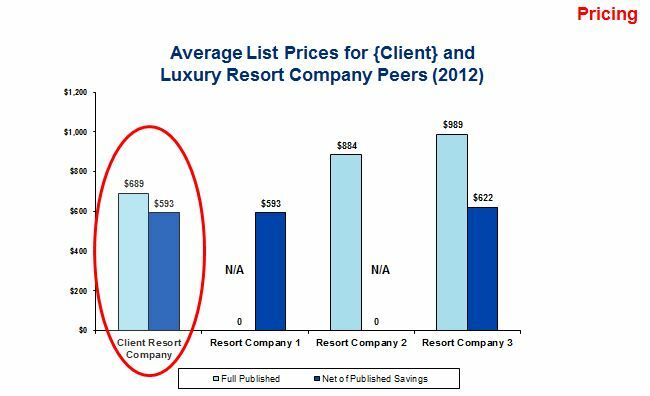 (Refer to the last section of this blog for examples of this rewards/incentive program). Without these incentives, large numbers of employees would not have participated in the program and many would have sat on the sideline or would have become program detractors vs. advocates. 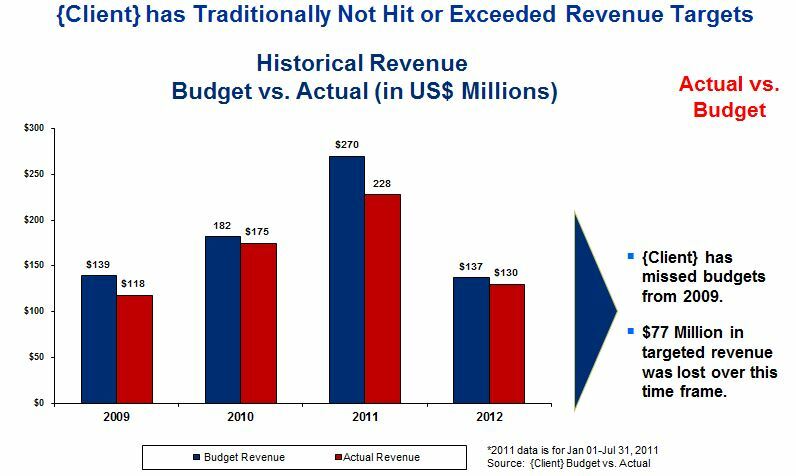 Innovations Are Value and Metrics Driven (Cost/Revenue/Quality, Employee Work-Life, etc.) – It is important that innovations be developed and ranked based on measures that will provide the greatest quantifiable impact to the company. A system of measurement must then be developed and applied such that every program participant is able to quantify the impact of each innovation and compare it to other innovations already in progress toward commercialization. At GE, this was rudimentary at best and caused a great deal of program inconsistencies where some questionable innovations headed toward implementation while other great ones were nixed early in the process. A consistent/metrics driven program would have avoided many of these pitfalls which led to employees questioning the fairness of the program. Continuous Improvement & Change Management Support Evolving to a Culture of Innovation – In order for the program to thrive longer-term, a program (program oversight for the innovation program) of continuous improvement and change support must be developed and employed. The program must be continually measured, improved, and evolved to address employee and/or company concerns, address program inefficiencies, and to take advantage of new processes, technology or changes in regulation or market directions. At GE, this was handled by a divisional level Work-Out Council which I was part of at the VP level. As a result of writing a letter to both Jack Welch (CEO) and John D. Rittenhouse (the Aerospace SVP) about continuous improvement, I was appointed to the Work-Out council at the VP Level under Al Horvath (Aerospace VP in Syracuse). On this Work-Out council we handled the administration of the program along with reviewing all of the developing and/or developed innovations. We were also responsible for reporting up to Senior Management on our progress, issues, roadblocks, top program successes, metrics, etc. In my opinion and in speaking to many at GE, the company has slipped since the GE Work-Out days in making the innovation program engaging and ‘fun’ for employees. 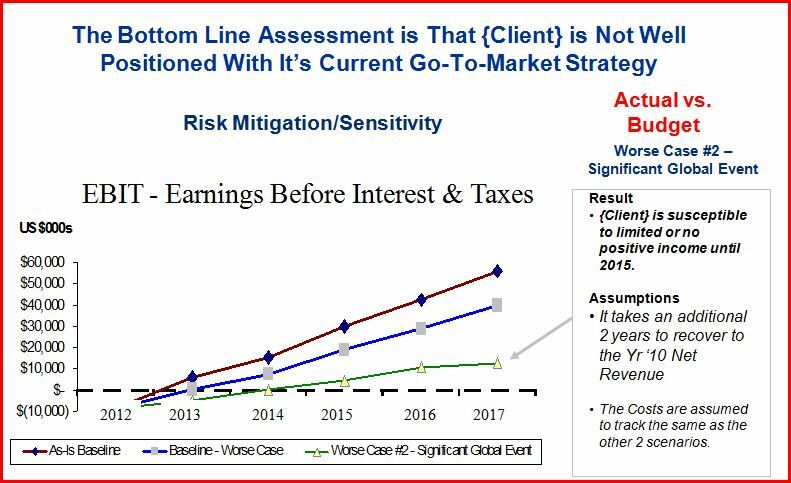 Insiders tell me the innovation program is more “black and white” now and driven most by metrics and six-sigma measures and the program “seems flat” and “uninspiring” vs. that of the Work-Out program under Jack Welch. 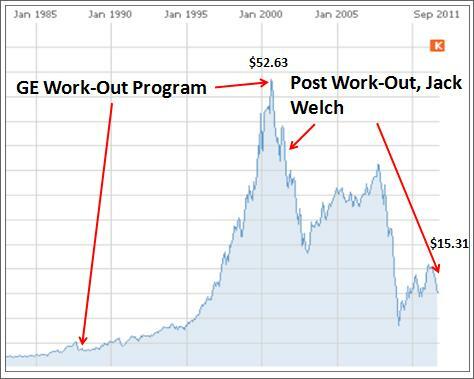 The following chart depicts how GE’s stock performed before, during and after the height of the Work-Out Program. 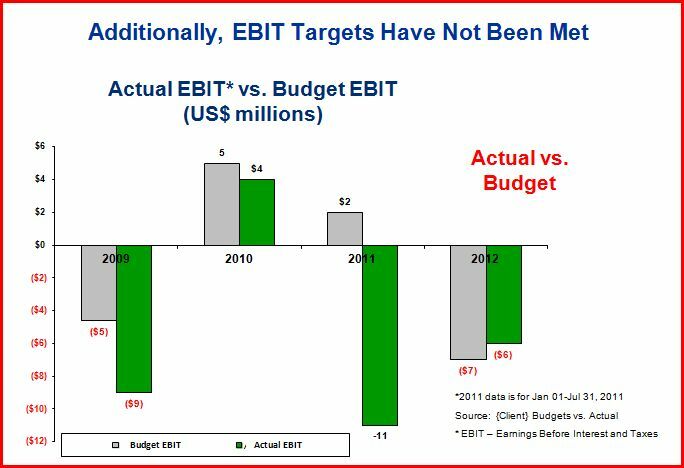 It is interesting to see that when the GE Work-Out program started to change from its original format and lose some of its employee focus (vs. Six-Sigma statistical focus), the company’s stock value began to erode at about the same time. 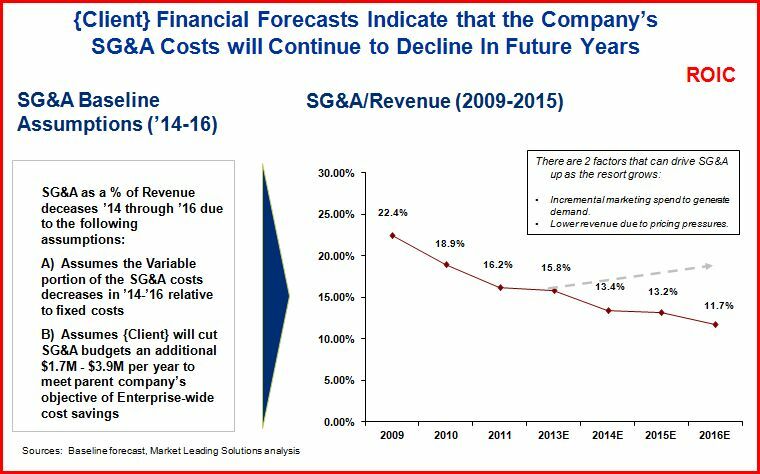 It seems from this chart and from insider accounts, that GE has lost its recipe for successful hyper-innovation. The following are all real-life examples of Work-Out, Innovation and Incentive/Reward Program Successes. These samples illustrate precisely how innovations occur within a company and what makes them successful. One of the many Work-Out Successes I identified while at GE is noted in the above graphic. 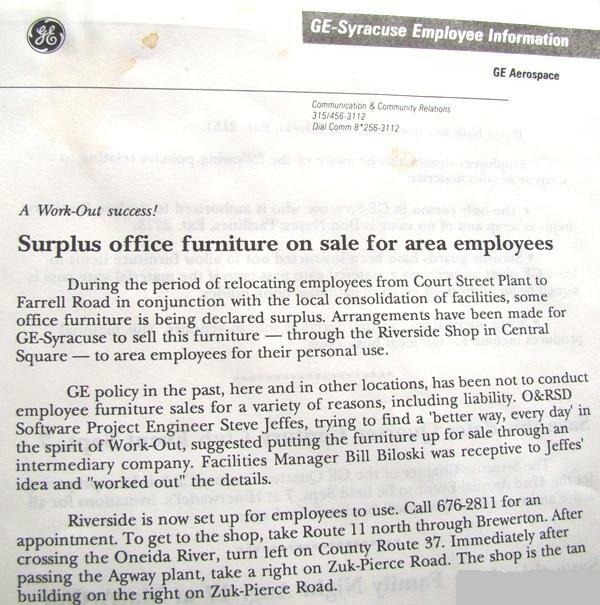 For years, GE discarded their slight used, but still in good working condition, office furniture by paying to ship it to dumps & landfills. One day, I passed a dumpster filled with office furniture in really good condition that I could use in my home office. I called the local facilities manager and asked if I could take any of it home and was told “No – we can’t have employees digging around in the dumpsters due to a liability issue. Someone could get hurt and we could get sued”. 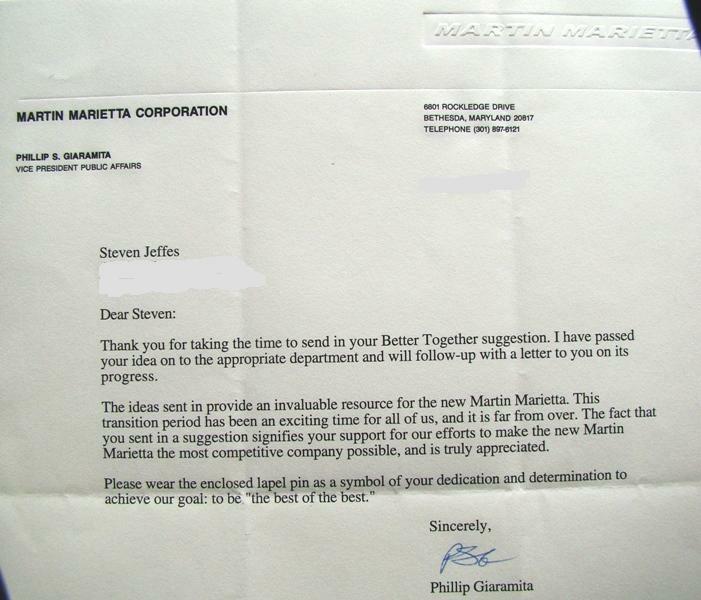 Above is my suggestion submitted for the “Better Together” program which Martin Marietta used following its acquisition of GE Aerospace. This program was far less dynamic and successful than the GE Work-Out program due to, in my opinion, a lessening of many of the “eight over eight” factors. Example – Rewards & Incentives for Innovation, Special Achievement, Extra Efforts, Etc. Above is my award for developing and delivering on a schedule acceleration plan for a major delivery to the US Navy. The Critical Design Review (“CDR”) was acclaimed as a “huge success” and was instrumental in GE retaining (vs. losing) the multi-million dollar Anti-Submarine Warfare (ASW) contract GE had with the US Navy. Above illustrates my participation on the development of an employee rewards & incentive system to compliment GE’s Work-Out program. I led this team to the development of what was called the “Recognition Awards for Valued Employees” or RAVE program. Awards were distributed via this program to the most valuable contributors to the GE Work-Out program. Above is my award for making the Aegis Ship Software Qualification Tests (SQTs) a success for both GE and the US Navy. The Tactical Load File (“TLF”) search tool mentioned above resolved some critical software anomalies that would have degraded ship safety and prevented the ship to safely fire its missiles. 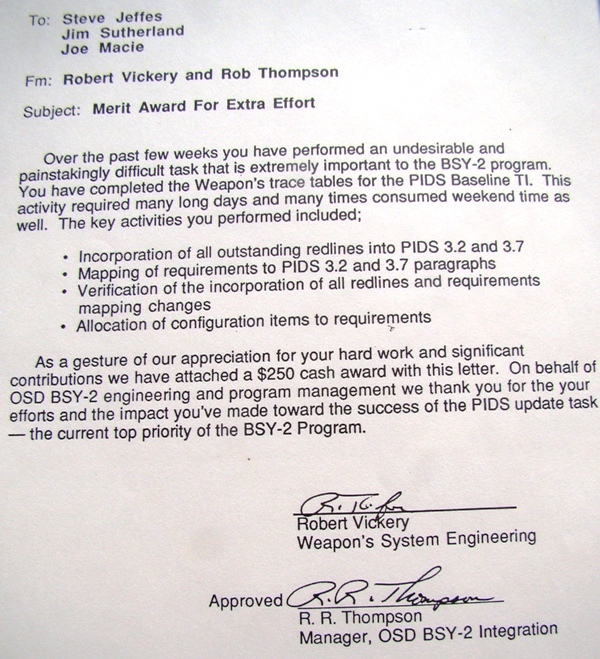 Above is my award for developing and delivering on a Prime Item Development Specification (“PIDS”) for a Nuclear submarine program to the US Navy. The PIDS was deemed “out of compliance” by the US Navy and I led a team to turn-around the quality of that deliverable into what was deemed as “exceptional” by the US Navy Top Brass. This was instrumental in GE retaining (vs. losing) the multi-million dollar submarine contract with the US Navy. GE’s recent logo changes: Subtle changes vs. dramatic re-design & re-invention. It is interesting to note that when GE was changing its logo from its 1986 to the 2003 design, John D. Rittenhouse, the then SVP of the Aerospace business, told Jack Welch: ‘Even you are having problems with this change thing – after all of the effort to re-design our logo, all you did was round off the corners a bit’. Conclusion – The bottom line here is that getting innovation right is a tricky recipe to duplicate and all of the right ingredients must be present for the program to be considered 5-star. If a company does not find the right mix to the recipe, a great deal of time and resources can be expended for a very questionable gain. It is clear that GE during Jack Welch’s tenure, GE perfected the ingredients and the results of the Master Chefs (employees and management) was a gourmet dish of higher profits, higher revenue and higher stock value. GE Work Out Clearly Worked! In my previous two blogs I covered the first two of three mega-trends that are hitting the social media marketplace for large Fortune level organizations. In the first blog, I addressed how the use of enterprise social monitoring and intelligence platforms are helping companies leverage key insights from an array of market activity and major trends including competitor activity & weaknesses, key opinion leader sentiment/needs, regulator trends and concerns, political leader and influencer sentiment, public opinion and key public concerns. In my last blog (2 of 3 in the series), I covered how Enterprise Collaboration Platforms are changing how teams communicate and interact in order to boost corporate productivity. A) What is a Social Innovation Platform (SIP) or Social Suggestion Box? An SIP is a social media application that allows the sourcing of innovative ideas, content, suggestions and inventions from an array of sources including internal company departments and employees (internal innovation/idea sourcing) and from external stakeholders, customers and experts (external innovation, content, or idea sourcing). Think of a company suggestion box on steroids and on the global web – that is what a SIP is. Has your company had your SIP of hyper-innovation, thus allowing you to utterly leapfrog your competition? If not, the rest of this blog is a MUST READ for you! These platforms are designed to increase intra-corporate idea & innovation collaboration, decrease time to market, and to enhance overall corporate productivity. There are two types of Social Innovation Platforms – internal and external. The platforms that source ideas and insights from the general public are typically called crowd sourcing solutions, but can also be called idea sourcing, idea & insights cultivation, etc. A SIP can radically change your corporate culture to be more innovative, change oriented, enable out-of-the box thinking and greatly enhance your ability to create great content/ideas/insights/innovative products/services, patents, etc. B) What are the benefits – Why are companies, organizations and government agencies adopting social innovation platforms capabilities? 7) Motivates key contributors – Motivates your employees by providing a transparent and easy way to handle idea management. Employees feel empowered to submit ideas and innovations in this highly transparent environment. ‘8) Empowers Teams and Departments – Encourages team empowerment and contributions and inter-departmental cooperation on ideas, innovations, patents, etc. 11) The overall goal of the increased innovation derived from these SIP is to decrease the time to market with products and services that have increased market relevance and can leapfrog the competition in terms of market demand. 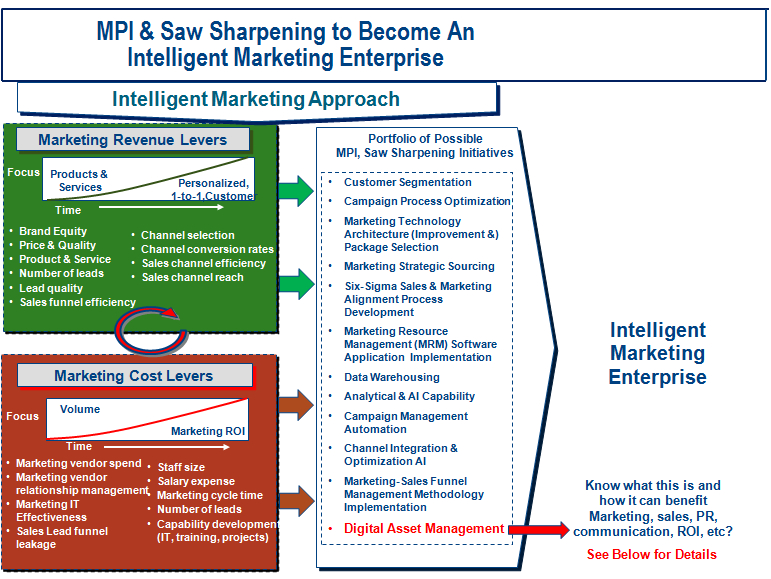 C) What are the hottest tools/applications on the SIP or Intra-Social Application market? Almost all SIPs are relatively new to the marketplace and few have been deployed to several Fortune-500 level companies. c. IdeaScale made Inc. magazine’s list of the fastest-growing private companies. The companies below are considered niche players in the SIP market in that they source very specific innovations and content from vendors, customers and stakeholders. 1) Brand Tags – http://www.brandtags.net/ Brand Tags is an interesting concept in that it solicits people via the internet to tag associated words that come to their mind when they think of a particular brand/product/service. Responses are then compiled into ‘tag clouds’ displays that reports back which words are thought of most often. To date, Brand Tags thousands of companies have participated in this ‘brand tagging’ and there are now ~2 million tags on their website. 2) CrowdSpring – http://www.crowdspring.com/ CrowdSpring assembles and leverages a large community of creative designers to provide an effective, easy and relatively inexpensive logo and custom graphics design service for smaller businesses and organizations. Persons can post design projects or copywriting projects, specify the price range they are willing to pay and then choose from a wide range of concepts/ideas/designs submitted from the CrowdSpring design community around the world. On average, there are more than one hundred submissions per project. The price paid for crowd designed logos or taglines start from around $200 USD. 3) CustomAdart – http://www.customadart.com/ CustomAdart asks a crowd of creative professionals to develop your perfect image at the price range you set. This concept is allowing companies to migrate away from the traditional stock photography model by allowing advertisers to post specifications for very custom and specific shots and then getting community members to submit their best images/graphics/photos to satisfy the desired specifications. 4) Fellowforce – http://www.fellowforce.com Fellowforce.com was founded to connect organizations to an array of high quality ideas, innovation and solutions. Fellowforce.com aims to open up organizations to outside participation from experts, consumers, and other interested parties to generate powerful new innovations and solutions via networked innovation via collaboration. Fellowforce.com enables open innovation, idea generation and problem solving to a multitude of organizations worldwide. This is the first open platform that covers a very diverse set of business areas such as business & strategy, human resources, marketing, sales, customer service, innovation process management, design, engineering, IT, and supply chain. 5) InnoCentive – https://www.innocentive.com InnoCentive is based on a straightforward concept in that, if a company is unable to solve a problem on its own, why not use the power of the Internet to see if other Subject Matter Experts (SMEs) can solve the problem? This concept has resulted in the establishment of the world’s first open innovation marketplace with a global network of ~200,000 ‘problem solvers’. In this network, you can find engineers, scientists, inventors, and business people with expertise in life sciences, physics, engineering, biology, chemistry, math, marketing, human resources and computer science. Companies can post their challenges and problems on the InnoCentive website, and offer registered problem ‘solvers’ substantial financial awards for the best submitted solutions. Problem solvers compete to win monetary prizes offered by various companies. Over 1,000 challenges have been posted thus far by nearly 200 firms, including large/global companies such as Procter & Gamble. 6) Philoptima, llc. http://www.philoptima.org/ Philoptima, llc.™ enables foundations, donors, and grant makers to describe a challenge to the idea community and to post cash prizes to incentivize ‘idea solvers’ to solve the issue put forth. This collaborative system facilitates participants coming together to collaborate and solve a wide variety of community and public interest related problems by connecting consultants, researchers, and subject matter experts that offer best-in-class solutions via a web-based open innovation community. 7) Poptent – http://www.poptent.net/ Simply stated, Poptent enables crowdsourcing for advertisements. Poptent is a relatively new start-up that solicits crowdsourced advertising ideas and content from an array of global creative talent. The company brings together a vibrant community of filmmakers, actors, comedians, graphic artists, animators and then connects them with companies who need their advertisement creative services. Companies and/or brands can post their requests for an advertisement or specific ad content, which is then developed and submitted by Poptent’s pool of global creative advertising talent – all via a robust web collaborative crowdsource application. ‘8) ThinkTank4 – http://www.groupsystems.com/ ThinkTank4 is a social collaboration & idea management platform that is used primarily by larger consulting companies. ThinkTank4 is a structured collaboration platform for professional services which enables content sharing, project collaboration and best practice/intellectual property management. 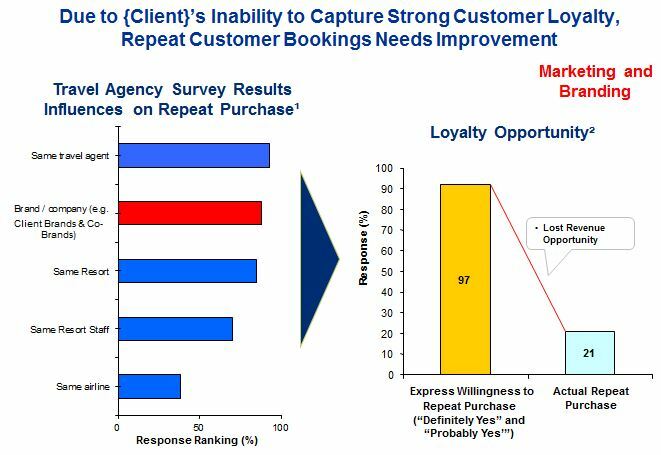 ThinkTank aims to increase profitability by enabling consultants to deliver more client value via reduced cycle time and reduced manual effort. D) How do you implement this capability – what are the steps and considerations on implementing this capability within your organization and company? Social Media innovation platform (SIP) implementation success requires comprehensive visioning; with stepwise implementation, guided both by an innovation paradigm shift & culture change, roadmap and integrated project plan. The bottom line here is that, if you don’t have an innovative company culture, implementation of a SIP will likely lead to shelf-ware and a system very few utilize to its full potential. b) Develop SIP management processes that provide organizational confidence and exercise process excellence transparency to solidify user/stakeholder buy-in and acceptance. That last bullet point is not a typo as I would honestly say that the #1 key to success in implementing this type of software is an extremely capable change management program. This type of software requires a behavior change on the part of your employees and management and it won’t come easily. I can say this with confidence – If you are not considering a heavy dose of change management as part of this implementation, your implementation is most likely going to fail! 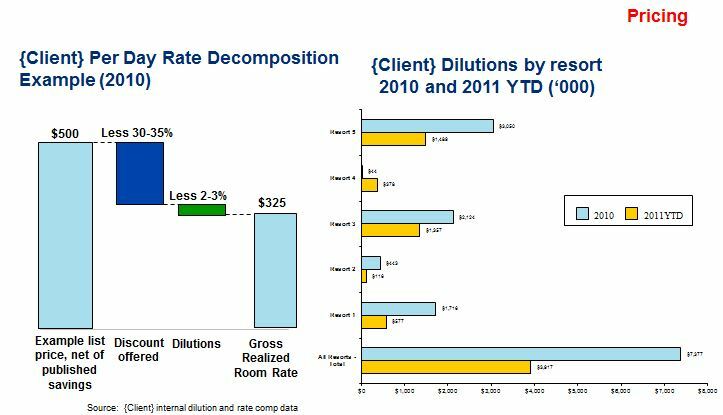 In summary, SIPs are gaining a great deal of Momentum. Many Fortune 500 companies are either planning to implement this enterprise capability or already have. Is your organization planning on implementing this potentially game-changing capability? If so, give me a call at 518-339-5857, as I call help you achieve world-class programs that enable you to surpass your competition and bring your organization or agency to the next level of innovation.